The University of Maryland Terrapins hosted ACC rival Duke University Wednesday, but highly anticipated hopes for the Terps to win at Comcast Center were dashed as they fell to the Blue Devils 80-62. The victory gave Duke (20-2, 7-1 ACC) a season sweep of Maryland (14-8, 4-4 ACC). The Terps upset the Blue Devils last year when playing at home, but Duke’s two stellar players, Kyle Singler and Nolan Smith ran over the Terps on their turf, with both scoring the first 16 points in the second half. Singler (22 points) and Smith (21 points) were not going to allow Coach K’s team to fall into its first losing streak since 2009 (against UNC and Boston College) after coming off an embarrassing loss to un-ranked St. John’s (93-78) last Sunday. The first half showed promise for the Terps as they were only down by seven going into the locker room with the score 40-33 after they cut a 13-point lead by drawing fouls on Duke. They used their defense and rebounds to their advantage to tighten the score with an “and one” then rebounding on two missed free throws by Miles Plumlee and scoring in the paint once more with seconds left in the half. Their strong defense caused six turnovers by Duke, and using big man Jordan Williams, outscored Duke 18-14 in the post. The first half was a good run, but the Terps were tiring themselves out thinking too much about how their opponent was steps ahead of them and couldn’t seem to catch up to the drive by the Blue Devils who were 50% in all areas on the court; their three-point opportunities were a big factor as they sunk their shots past the arc. The Terps kept the game intense for the first 10 minutes of the second half, going on a 9-2 run bumping the score 56-49 and giving them a glimpse at a possible comeback, with Williams boxing out under the net and giving him a “double-double” game, with 20 points and 10 rebounds. But it wouldn’t be enough as Singler scored 11 points in a row, and Coach K’s boys hot shooting kept the Terps at bay and with 5 minutes left, took the game away with Duke up 66-54. Despite foul trouble early on for Duke, the Terps did not seem to be able to connect on their foul shots (were 16 for 23 on the line with five minutes left) and botched up court opportunities, and gave away the rest of the game to their rivals. One of college basketballs greatest coaches died today, Friday June 5 in the early morning after suffering a massive heart attack among other medical issues over the past few years. John Wooden, 99, holds the record for one of the most winningest coaches in Division I college basketball. One of the greatest coaches of all time, Wooden’s stats will prove that he not only deserves to be known as such, but his character also is one to remember. Wooden had 88 consecutive games during the 1971-1974 seasons as well as 38 consecutive NCAA tournament games between 1964-1974. Wooden to this day holds those records. Wooden also led the UCLA Bruins to 10 NCAA championships — at one time winning seven in a row — during a 27-year run that ended with his team cutting down the nets one last time in 1975. Wooden coached basketball great Kareem Abdul-Jabbar and Bill Walton among many others and also had a few Neismith award winners under his regime. Walton told The Associated Press from the NBA Finals that he last visited with Wooden a few days ago at the hospital. Duke University has always been one of the top teams in basketball, and on Monday night proved why as they snagged another national championship away from underdog Butler University. With many people vying for the cinderella team from Indiana to rise up and push the giant off their mountain, Butler pushed hard and played with intensity. But in the end, Duke overcame Butler 61-59. The game, though, is what was most impressive. This is Duke’s head coach Mike Krzyzewski’s fourth national championship. His record of winning that game now stands at 4 of 6. The last time Duke won was in 2001. Coach K also has a 77-22 record of wins and losses in the tournament, which leaves him with the most wins in the NCAA tourney. Coach K is also now tied for 2nd in most wins overall in the tournament with Adolph Rupp. The only other coach that is probably one of the best coaches of all time is John Wooden. The Final Four games were played tonight, April 3, with Butler and Duke advancing to the championship to compete against each other on Monday to take home the trophy. In a classic cinderella team tale, Butler is on the radar and has been since their first game against UTEP. I know I went back and changed my original bracket and had Butler losing to UTEP that first round. You can bet I am kicking myself now. But ever since Kansas got knocked out of the big dance by Northern Iowa, I have been pulling for Butler and they have not failed. Under coach Brad Stevens, Butler has impressed many, including themselves. They have had home city advantage (the last occurance was in 1972 with UCLA who ended up winning the whole championship) and have been compared to the Indiana Hoosiers, made famous by Hollywood in the movie about the team. Coach Stevens is an impressive 33-year-old smart leader for the Bulldogs. 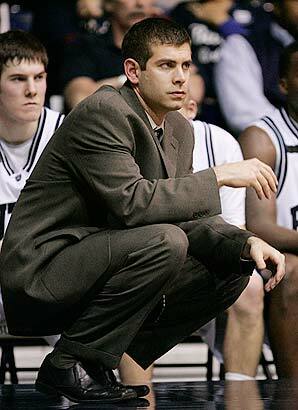 Stevens came into the scene during the 2000-2001 season as a volunteer and was later promoted to full assistant coach the year later. In the 2007-2008 basketball season, he was named the head coach and after winning 30-games that first season, became the third youngest coach in NCAA history with a 30 game winning season. The 33-year-old will go head-to-head as he leads his team for the first time to the championship game against one of the biggest and most well-known coaches to basketball players across the country. 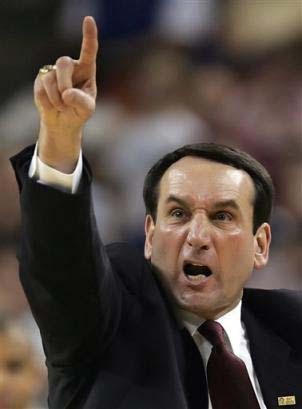 Coach Mike Krzyzewski of the Duke University BlueDevils has been coaching for 30-years. He is experienced and knows how to win a basketball game, especially this big game. It is somewhat interesting that the first year Coach K started coaching, Coach Stevens was only a 3-year old. Coach K also has led his team to winning three NCAA championships and appearing in 11 Final Fours in those 30-years. Every year for the University of North Carolina and Duke University basketball games, I am sure to amuse anyone who happens to be out in public with me. 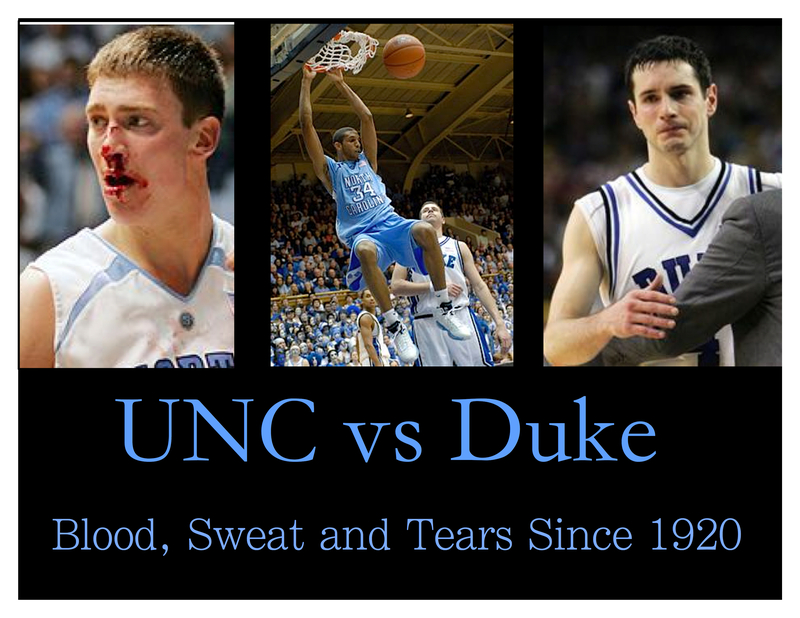 Two of the biggest games of the year for me…for one of the biggest rivalries in sports. I get decked out. I wear the shirt I made myself declaring my support for the Tar heels and my disdain for the Blue Devils. Everything I wear is blue and white…and there was one year I do believe I painted my face. This would be acceptable if I was in Chapel Hill, NC watching the game, or even at my first college, East Carolina University. But no, I show my fanatic side just uptown at local bars in Towson. Towson, a place where school pride in their sports teams is nonexistent. Do I look crazy? Absolutely. The huge snowmageddon kept me inside to watch the game on my couch and only talk ‘smack’ via text messaging and IMing others through Facebook. Would you be able to get excited and intensely into a game this way? Yea, I couldn’t either. Why is this game so important? 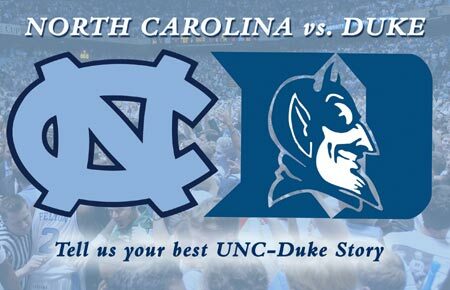 For those who have never heard me during one of these games, or don’t keep up with sports, a poll conducted by ESPN in 2000 ranked the UNC versus Duke rivalry as the third greatest American sports rivalry of all-time. Sports Illustrated on Campus named it the #1 “Hottest Rivalry” in college basketb all and the #2 rivalry overall in its November 18, 2003 issue. The hugeness of the rivalry, which started in a game on Jan. 24, 1920 and played twice a year, is intensified by the proximity of the two schools, located eight miles apart. Having lived in NC for two years, this rivalry is even a bigger deal than these stats, what you see on TV and what you may have heard. Snow would never keep these two teams from playing each other,or ending the rivalry. A tornado wouldn’t keep this game from being played. But in last night’s defeat to Duke 64-54, UNC buried itself and its season is now over. The chances of the Heels going to the big NCAA tournament this year are as good as all the snow here in Maryland melting by tonight.